Actually the bees have never left. They have been around almost continuously ever since my first post “Rats, bees & barn owls” some 9 years ago. We have pretty much tolerated each other since then but I had to do something when, a couple of months ago, they attacked the gardener and harassed the dogs and I one afternoon. 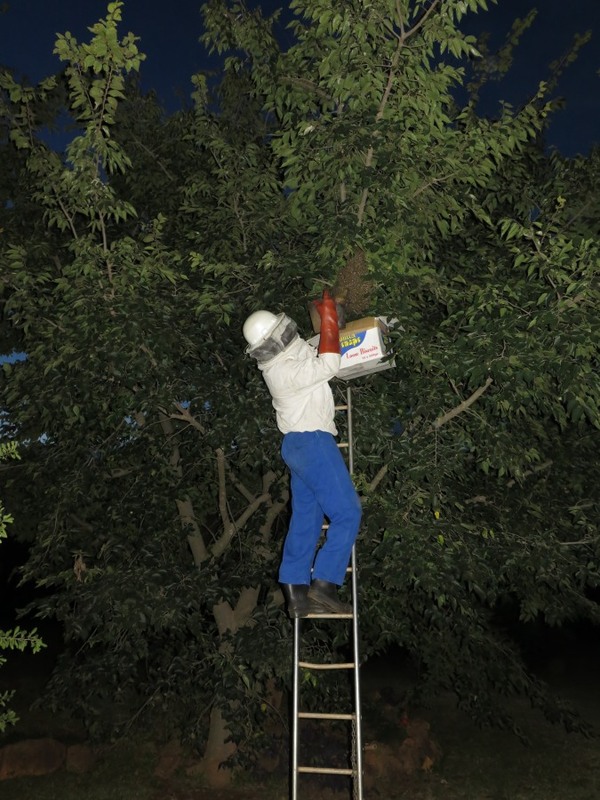 Mike the bee man was called in and after two attempts the swarm in the chimney was killed. Alas it was not long before another swarm was scouting the chimney, attracted by the smell of the defunct hive. They took refuge in a nearby tree whilst making a decision. I called Mike again and he arrived with his bee handler. Swarming bees are not aggressive; they have nothing to protect and that’s important as stinging for them is fatal. The ultimate sacrifice. African bees have a fearsome reputation for defending their hives when they have brood or honey. 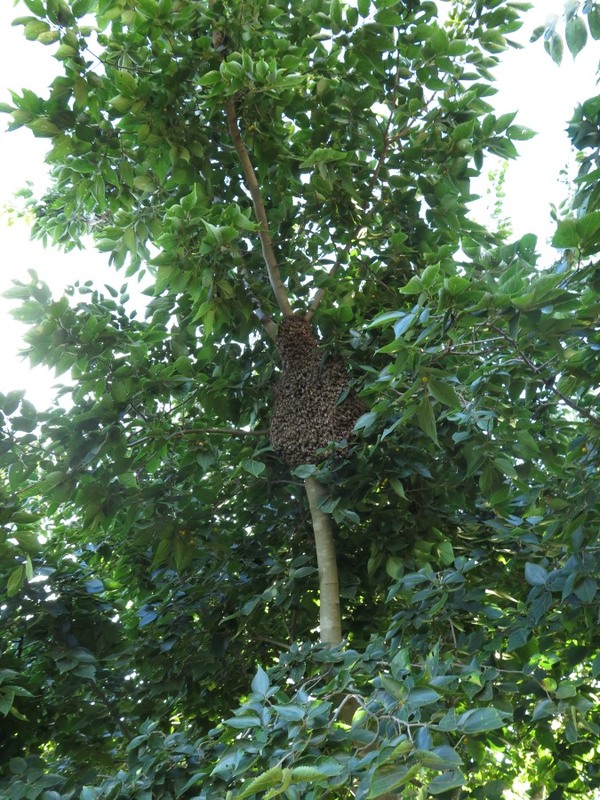 In extreme cases the whole swarm will go into a stinging frenzy and can kill humans and livestock. Somewhere I have a photo of my father as a young man holding a swarm of bees on a branch and not wearing any protective gear at all. Mike’s bee handler was not taking any chances though I noticed he was not as heavily kitted out as he would have been during the day when working with and established hive (I used to keep bees in a small way. 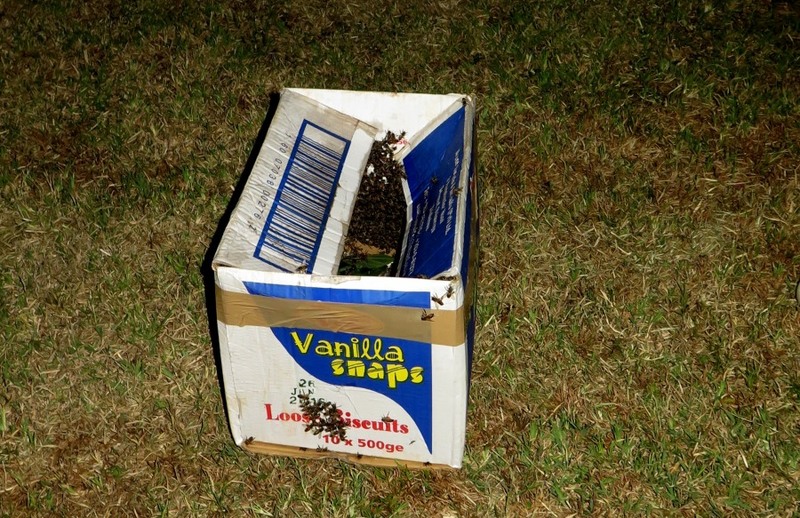 A few puffs of smoke and the bees were bumped into an open cardboard box and brought down to the ground. Mike and I (we were both unprotected) watched from a respectful distance. The bees buzzed a bit in the box and Mike said they would soon calm down when the queen released her pheromones. No point in wasting good workers! They soon did and the box was picked up and they were on their way. The next day there was a small cluster of bees on the ground nearby so I collected a catchbox (a small hive prepared with attractive prop0lis) and they duly moved in. A few days later there were MORE bees around the chimney and as I was about to go on holiday thought it would be a good idea to get another two catch boxes to try and attract them away. They day before I left the swarm moved into one of the boxes. 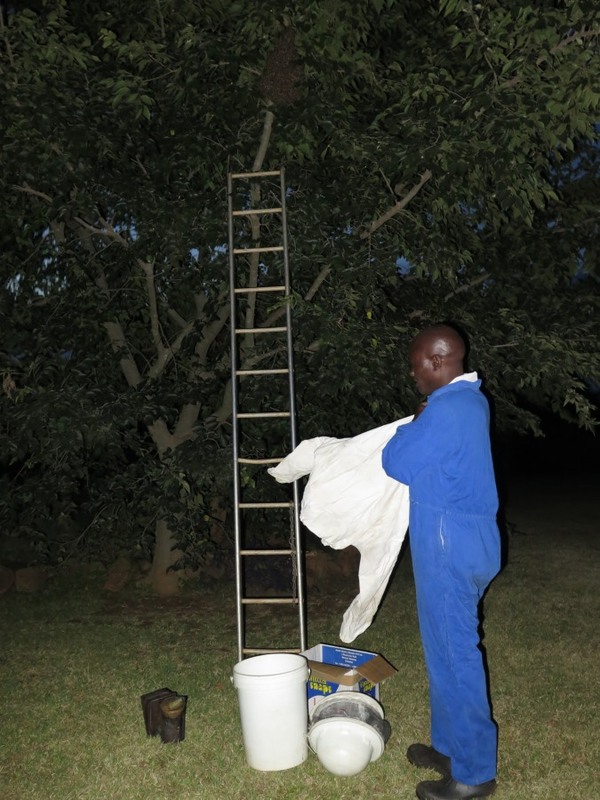 For the moment all is peaceful on the bee front and Mike will come and take the swarms away and put them to work in his commercial bee keeping practice. The next swarming season is in August and I will have to be prepared again.